Psychologist Dr. Robin Smith reveals how to turn vows made at the altar into realistic plans for a long and happy marriage. Dr. Robin Smith advises couples on how to take the wedding vows that were made in earnest and in innocence, to a level where they can be used to build a happy, healthy, satisfying and long-lasting marriage. Lies at the Altar is for couples who are planning marriage, are newly married, or who have been married for years. 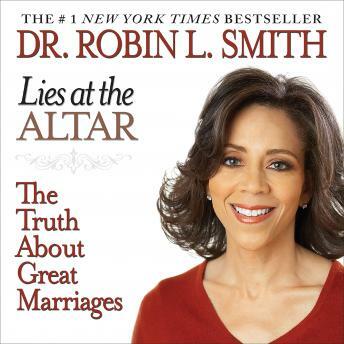 In Lies at the Altar: The Truth About Great Marriages, Dr. Robin Smith addresses the unspoken needs, unasked questions, outrageous expectations, and hidden agendas that often linger beneath the surface of the wedding vows and appear later to cause power struggles, suffering, and feelings of hopelessness in marriages. Dr. Smith discusses why it's important to have one's "eyes wide open" in a marriage; how to write true vows to live by; and why it's never too late to rewrite your vows. She illustrates her advice with detailed stories from her own life, as well as from couples that she has counseled. And in her inspiring conclusion, she invites couples to light up their lives by acknowledging each other as individuals, each of whom lights a candle, and who lights a third candle which represents "us". Calling "truth" the secret ingredient of great marriages, Dr. Smith teaches individuals and couples how to find the truth within themselves and their partners, whether they are heading to the altar, suffering in an unhappy marriage, divorced, or simply want to bring more satisfaction and intimacy into their relationship.